Fishing For Customers: How Do You Educate a Customer, Part 1? Fishing For Customers - Free Small Business Marketing and Advertising Tools, Tips, Articles, Strategies, and Advice. Fishing For Customers: How Do You Educate a Customer, Part 1? Bob's enthusiasm is contagious. He's convinced that America's tap water isn't safe to drink because of the presence of pollutants. The water filter he sells removes minerals, microorganisms, toxic metals, and organic chemicals. First, he offers a solution to people who don't recognize that they have a problem. They will naturally be skeptical. Bob is not alone with this "Teach them why they need it" vs "Ask them to choose mine" dilemma. A manufacturer can't sell his brand of coffee to people who don't drink coffee. First, those people must choose coffee as their beverage. Only then can the manufacturer persuade them to choose his brand instead of another. The provider of high-speed Internet can't sell connections to households without computers. First, the family must choose to purchase a computer. Secondly they must elect to be connected to the Internet. Only then can the provider convince that family to select his service over that of a competitor. And Bob can't sell his brand of water filters to consumers who find the quality of their tap water to be quite acceptable. Why Shouldn't Bob's ads explain and educate? Because even the most effective marketing message can only advance the decision making process by a single step at a time, and there are too many steps between "Have you ever wondered what's in your drinking water?" and "Will you buy my filter today?" Selling to an existing need may eliminate the credibility issue, but it doesn't eliminate those additional steps. Advertising can advance the process by only a single decision at a time. Which of those choices should the dealer's advertising try to influence? The Cattlemen's Beef Board pools the individual members marketing dollars in the “Beef. It's what's for dinner” campaign. Short term, with enough concentrated advertising, programs such as this can create a bump in the sales curve. Unfortunately, most co-operative advertising programs don't have the resources long term to significantly grow the number of buyers. Convincing people who don't already feel the need is hugely expensive. More expensive than most small companies can afford. Educating customers is not a cost effective advertising strategy for most small business. Instead, consider addressing "pre-educated" potential customers - those people who already understand the issue. They will be searching for solutions. They will consider yours. Bob needs to seek out those folks who are already looking for him, but don't know it yet. In Part Three we'll consider a multimedia solution for growing the size of the market (and our individual share of it), as well as an exception to the conclusion you just read in Part One. Chuck McKay is a marketing consultant who helps customers discover, and choose your business. 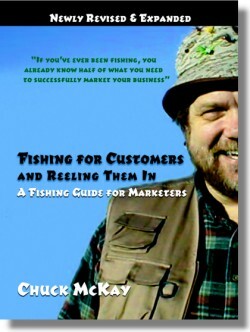 Questions about the strategy of educating customers may be directed to ChuckMcKay@ChuckMcKayOnLine.com.